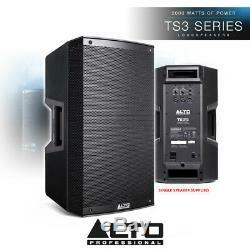 Pair of Alto TS315 Active Speakers 2000W 15 Powered PA DJ Loudspeakers NEW. Built with your needs in mind, this package is brought to you by Electromarket. 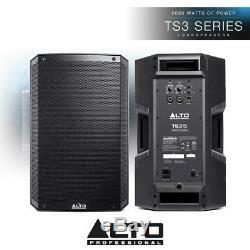 Package Includes 2x Alto TS315 2000-Watt 15-Inch 2-Way Powered Loudspeaker. BBA4092 - Alto TS315 2000-Watt 15-Inch 2-Way Powered Loudspeaker. The all-new Alto Professional TS3 Series of professional loudspeakers deliver solutions for every performance and installation challenge. With 2000 watts of explosive bi-amplified power and newly-designed transducers, these speaker systems deliver truly high-performance audio, without compromise or restriction. Their elegant industrial design, lightweight but rugged construction, versatile mounting/placement application and intuitive user interface achieves a level of excellence and refinement that exceeds expectations. 2000 W peak (1300 LF + 700 HF) 1000 W continuous RMS (650 LF + 350 HF). 15-inch (381 mm) LF driver, 3-inch (76 mm) high-temperature voice coil. 1.4-inch (35 mm) voice coil, neodymium magnet HF driver, with precision wave guide. High quality, lightweight, cabinet design for easy transport, set up and installation. Pole-mountable, wedge monitor, bracket installation or flown application with integral M10 suspension points. Integrated 2-channel mixer with dual XLR 1/4-inch combo mic/line inputs, independent level controls, XLR Link output, Contour EQ switch and Ground-Lift switch. Custom engineered high-efficiency class D amplifiers with passive cooling design No fan means the speaker runs cleaner, quieter and has greater long-term reliability. Designed and tuned in the USA. Power Output: 2000 W peak (1300 LF + 700 HF) 1000 W continuous RMS (650 LF + 350 HF). LF Driver: 15-inch (381 mm) LF driver, 3-inch (76 mm) high-temperature voice coil. HF Driver: 1.4-inch (35 mm) neodymium magnet HF driver with precision waveguide. Maximum SPL: 134 dB peak, 131 dB continuous (dB SPL at 1 m). Frequency Response: (-3dB): 50 Hzâ20 kHz. Frequency Range: 43 Hzâ22 kHz (-10 dB). Horn Coverage: 90 H x 60 degree V nominal. Equalization: Contour Switch Low and High Frequency +3dB Boost. Connectors: 2 2 XLR/TRS 1/4 (6.35 mm) combo inputs, (1) XLR link output, (1) IEC power cable input. Controls: (2) Volume, Power on/off switch, Contour switch, Ground-Lift switch. Indicators: 2 x Power LED (front and rear), Clip limiter LED. Protection: Electronic clip, Thermal and transducer overdrive protection. Power Connection: IEC with Mains Fuse. AC Voltage Input: 100,110â120,220â240 V, 50/60 Hz. Enclosure: Trapezoidal, injection-molded, polypropylene enclosure, with perforated steel grille. Mounting/Installation: 36 mm standard pole mount, Wall or celling mount using TSB810 bracket, Flown application with integral M10 suspension points, Wedge monitor. Dimensions (HxWxD): 25.7" x 16.6" x 15.4 / 652mm x 421mm x 392mm. Net Weight: 41.3 lbs. A tracked service is available when you select a 48 hour or 24 hour courier service. Due to our carriers charging extra for Highland and Islands, we need to pass this charge onto our customers. Where do you deliver to? We deliver to the UK, Ireland and internationally covering most of the EU, including. All deliveries will require a signature so please ensure someone is present to sign for the item. The couriers will try and deliver the item twice before returning the item to us. Sound and lighting equipment can be very technical, and there are some simple practices to avoid unintentional damage to your equipment. Our goal is for your equipment to last as long as possible, so we are always on hand to give free advice about how best to use your equipment to prevent user error. The actions from here can range from a charged repair, replacement or upgrade. We'll also give advice on how to prevent damage to your equipment in the future. Please note: we do not cover faults caused by accidental damage, neglect, misuse, modification, liquid ingress or normal wear and tear. We also request that you return the goods to us in its original packaging where possible. Our welcoming Sales Team are experts in all aspects of the entertainment industry. When will I receive confirmation of my order? Will you accept offers on price? All of our listings are given a non-negotiable, fixed price. However, If the item is B-stock, clearance or damaged we may accept offers on price. Please check the listing for details. Can I come in store and collect my item(s)? Sorry - we do not accept reservations on items. How can I return my item? The item "Pair of Alto TS315 Active Speakers 2000W 15 Powered PA DJ Loudspeakers NEW" is in sale since Wednesday, May 9, 2018. This item is in the category "Sound & Vision\Performance & DJ Equipment\DJ & PA Packages". The seller is "electroxtra" and is located in Thurrock, Essex. This item can be shipped to European Union member countries.